Although I will still file it under ISTE standard 2, this article is a little different from your usual tip of the web of the web. 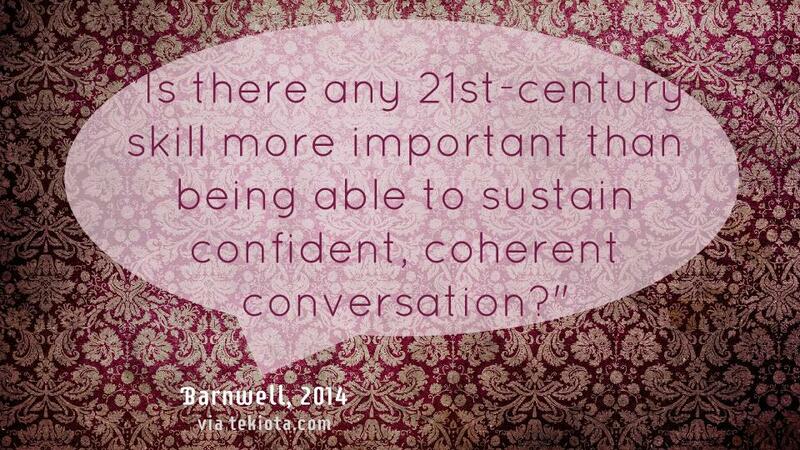 Today we’ll address one of the foundational skills that should precede using technology: the art of conversation. In fact, we will look into how to have a good conversation, and just as importantly, how to teach students how to have a good conversation. Don’t multitask. Be in that moment. 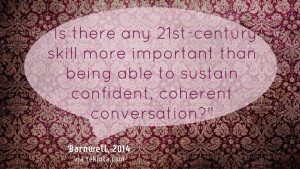 If you want to get out of that conversation, get out of the conversation. Don’t pontificate. If you want to state your opinion without any opportunity for response, write a blog. Use open-ended questions. Start your questions with who, what, when, where, why and how. Go with the flow. Thoughts will come into your mind and you need to let them go out of your mind. Don’t equate your experience with theirs. It’s not the same. It is never the same. Try not to repeat yourself. Sometimes we keep rephrasing a point over and over. Don’t do that. Stay out of the weeds. People don’t care about the years, names, date and details you are struggling to come up with. Listen. We would rather talk, but instead listen. Paraphrasing Buddha: “If you mouth is open, you’re not learning”. Be brief. Don’t miss Celeste’s sister quote on this tip. Greet people. Say hello and goodbye. Notice people around you. Say please. Never omit this word when you ask for a favor. And thank you. Always be thankful when you receive something from someone, especially when it is a compliment. That’s it for today. I am on my way to have better conversations. Thank you Celeste.